Summer time, to me, means enjoying light, but tasty treats. Like fresh fruit. And what could make fresh fruit even better? Not just any fruit dip, though. This stuff is easy, tangy, and so pretty, it’s company worthy. First, mix together 1/2 a cup of Greek yogurt and 1 (8 oz) tub of Lite Cool Whip. *I used about 2 tablespoons of honey. That’s it! 5 simple ingredients combined together, and you’re done. Well, except, for adding a little leftover orange zest on top for garnish, but that step is completely optional. In a medium sized bowl, combine together the Greek yogurt and whipped topping. Add the orange juice, zest, and honey, and combine. Garnish with orange zest (optional). Serve with various fruits, such as: Pineapple, Apple, Strawberries, Melon, Kiwi, Grapes, etc. What is better on Easter than chocolate eggs? Chocolate eggs filled with cheesecake. Yummm! * Since the recipe for Lemon Cheese Cake Frosting basically makes a lemon curd-like filling, I used it (divided by 4, since I only had one lemon) to make my own (recipe at the bottom). I had a really hard time finding empty hollow chocolate eggs in the store (and believe me, I went everywhere looking for them), which was completely surprising cause I thought they would be easy to find. By the time I did find some online, it was too late to have them shipped. So, at the last minute I decided to go with hollow chocolate eggs with a marshmallow peep inside. Cut them open, remove the peep inside, and voila. . . they were perfect for what I wanted. 1) Using a serrated knife, cut the chocolate egg in half. I cut my eggs length-wise, so that each egg would make two servings. And if you’re like me, remove the peep inside 😉 Then, place in the refrigerator to chill until you’re ready to fill them. Tip: If your egg breaks, like one of mine did, you can try melting a little extra chocolate and using it as a glue to bind the pieces back together. Then, place in the freezer or refrigerator for a few minutes til the chocolate hardens. 2) Whip the heavy cream in a mixing bowl until it reaches stiff peaks, then set aside. 3) In a large mixing bowl, combine the softened cream cheese, powdered sugar, and vanilla extract until it’s smooth and fluffy. Fold in the whipped cream. Folding in the whipped cream. 4) Using a pastry bag (or a plastic freezer bag with one corner cut out), pipe the cream cheese/whipped cream mixture into the chocolate eggs. 5) Using another pastry bag (or again, a plastic freezer bag with one corner cut out), pipe the lemon curd into the center. Chill the eggs for at least 30 minutes to allow them to set up. Then, enjoy! *The recipe below will make about 1 cup of lemon filling. **If you’re using store-bought eggs, you might want to use 3 egg yolks instead. 1) Mix all of the ingredients together and cook in a double boiler until the mixture thickens (takes about 25 minutes or slightly longer). Make sure to stir constantly. Allow to cool completely before using (it will thicken even more after cooling). Using a serrated knife, cut the chocolate egg in half. I cut my eggs length-wise, so that each egg would make two servings. Then, place in the refrigerator to chill until you're ready to fill them. Whip the heavy cream in a mixing bowl until it reaches stiff peaks, then set aside. In a large mixing bowl, combine the softened cream cheese, powdered sugar, and vanilla extract until it's smooth and fluffy. Fold in the whipped cream. Using a pastry bag (or a plastic freezer bag with one corner cut out), pipe the cream cheese/whipped cream mixture into the chocolate eggs. Using another pastry bag (or again, a plastic freezer bag with one corner cut out), pipe the lemon curd into the center. Chill the eggs for at least 30 minutes to allow them to set up. Then, enjoy! Is there nothing more summery (or delicious) than enjoying a fresh, sweet peach with juice dribbling down your chin and all over your fingers. Nothing in my book. Sister Dean, one of our neighbors and a close family friend dropped off a bag of very fresh peaches last week. After a few of them had been devoured (cause, you know, we’ve got to test them out, right 😉 ), I put a sign on them letting everyone know that the rest were off limits cause I’d be using them for something special. Alright, I didn’t go quite that far (I actually have had to resort to putting signs on pies and cakes in the past), but I did hide put them behind something in the refrigerator. So, yesterday, after watching a Devious Maids marathon and catching up on the episodes I’ve missed lately (I love that show, don’t you? I’m dying to know who Flora’s killer is), I set out to make one of my favorites, old fashioned peach cobbler. While I love the easier version of peach cobbler (you know, where the recipe calls for a stick of melted butter, a cup of flour, a cup of sugar, a cup of milk, and peaches, and you kind of dump them all together), having a crust made from scratch just makes cobbler so much more special. Peach cobbler with fresh whipped cream. * I don’t really like overly sweet pie crust, but if you do add a little more sugar to it. * I buy fresh nutmeg from Publix, then keep it in the freezer til I need it. Not completely sure how much was used in this recipe, but I would definitely say it was less than a 1/4 teaspoon. 1) Start by stirring together the dry ingredients for the crust (flour, sugar, and kosher salt) in a medium sized bowl. Then, cut in the butter by using a pastry cutter, your hands, or a food processor. Once that’s done, add the water and stir just until combined. You may need more or less water than called for, depending upon how dry the dough is. If you need more, add it a very small amount at a time. 2) Form the dough into a nice ball and cover with saran wrap and refrigerate for at least 15 minutes. 1) In a large saucepan on medium heat, combine the butter, peaches, sugar, lemon juice. Cook, stirring occasionally, just until the sugar has dissolved and the liquid begins to become syrupy. Remove from heat and allow to cool. 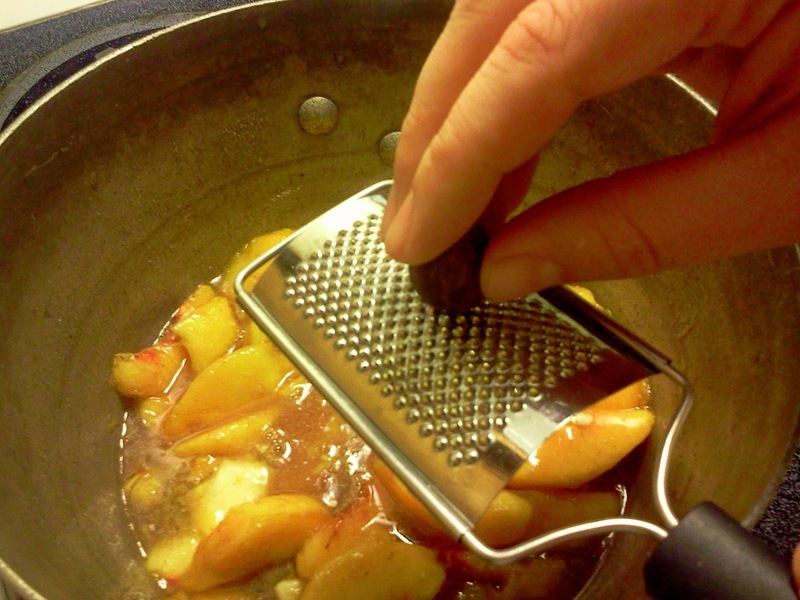 Grating the nutmeg into the filling. 1) Divide the dough into two balls: one for the bottom crust and one for the top. Roll out the ball of dough for the bottom crust to about an 1/8 inch thickness. Place in a small glass baking dish (I used a 9×9) so that it covers the bottom and up the sides. Trim off any excess dough. 2) Pour the cooled peaches and juice in the baking dish, making sure they’re evenly spread out. 3) Roll out the ball of dough for the top crust to about the same thickness. Cut into several one inch wide strips. Place on top of the peaches criss-crossed to form a lattice crust (see how to make a lattice crust here). Brush with the crust with melted butter and sprinkle with sugar. 4) Bake in a 375F degree preheated oven for about 30-45 minutes (give or take) or until the top crust is golden brown.